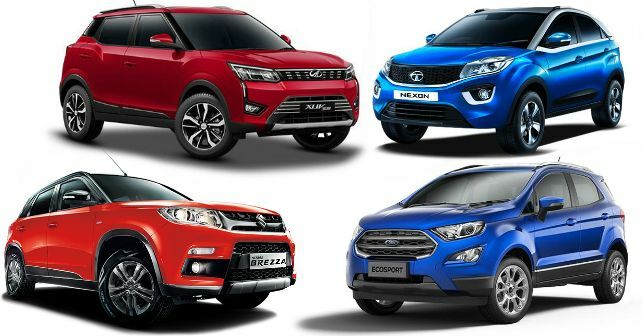 On paper, the Mahindra XUV300 looks extremely promising but how does it compare with its immediate competition – the Vitara Brezza, EcoSport and the Nexon. Engine: Mahindra will bring the XUV300 with petrol as well as a diesel engine option. The diesel-powered XUV300 sports the same motor as the Marazzo, but in this car develops 115bhp and 300Nm. The petrol, on the other hand, pushes out 110 horses and 200Nm from a 1.2-litre turbocharged motor. At the time of launch, the baby XUV will only be available with a 6-speed manual transmission. An automatic will be introduced at a later date. Of all the cars here, the Maruti Suzuki Vitara Brezza is the only one to not offer a petrol engine. In fact, the diesel engine that it is plonked with is the smallest, least powerful of the lot. The Brezza makes 89bhp and 200Nm. Maruti Suzuki, however, does give the option of choosing between a 5-speed manual and an AMT. The EcoSport is the only one here to be offered with three engine options. The diesel remains the same as before – a 1.5-litre 4-cylinder mill that sends 99bhp and 205Nm to the front wheels. This engine only comes mated to a 5-speed manual transmission. Ford also has the new 1.5-litre 3-cylinder Dragon series petrol on offer. In the EcoSport, it makes 121bhp and 150Nm and comes with the option of a 5-speed manual and a 6-speed torque converter. Last year, Ford also reintroduced the 1.0-litre Ecoboost in the EcoSport. This one makes 124bhp and 170Nm and is married to a 5-speed manual. In terms of engine and transmission, Tata has all the combinations you’d possibly want. The diesel 1.5, as well as the petrol 1.2 motor, develops 108bhp – torque rating, however, stands at 260Nm for the diesel and 170Nm for the petrol. Tata offers both these engine with a 6-speed manual and a 6-speed AMT option. Dimensions: The Mahindra XUV300 is based on the same platform as the SsangYong Tivoli sold in the global market. While the Tivoli is 4.2 metres in length, Mahindra has managed to restrict the XUV300 under four metres in light of the Indian regulations. That being said, at 2,600mm the wheelbase continues to be the same – which, by the way, is the longest in the segment. At 1,821mm the XUV300 is also the widest of the four compact SUVs. While the length of all four cars is more or less the same, it’s the wheelbase that set them apart. After the XUV300, the EcoSport has the second largest wheelbase at 2,519mm – which is considerably smaller. The Vitara Brezza and the Nexon have a wheelbase of 2,500mm and 2,498mm respectively. In terms of width, at 1,811mm the Nexon is almost as wide as the XUV. The Brezza and the EcoSport are relatively narrower. Brakes and Tyres: Of the four cars in the discussion, the Mahindra is the only one to come with disc brakes on all four corners. All other compact SUVs here come with a disc setup at the front and a drum brake at the rear. The Mahindra offering is also the only one here to come fitted with 17-inch alloy wheels - all others come with 16-inch alloys. The EcoSport is the only car here to come fitted with 205 section tyres, all others sit on 215 section rubber. Features: Mahindra clearly wants to gain an advantage over its rivals in this department. While all of its rivals here come with just a reversing camera, the XUV300 gets additional segment-first front parking sensors too. And that isn’t the only segment-first feature that the XUV comes with. The compact SUV also gets dual-zone climate control, heated ORVMs, tyre pressure monitoring system and more. The Brezza is the only car here to get cruise control. All these differences aside, all four cars come with a touchscreen infotainment system with Apple CarPlay and Android Auto, button start, keyless entry and electrically powered ORVMs. We recently got our hands on the Mahindra XUV300 in Goa, and we have to say that the SUV indeed a wholesome package. From design and space to features, the XUV does almost everything right. And then it also sets new benchmarks with regards to the features it has on offer. What remains to be seen is the price at which it will be launched, and we get a strong feeling that Mahindra will be competitive in that aspect as well.